Wondering what to do with Easter eggs now that you’re done with Easter? 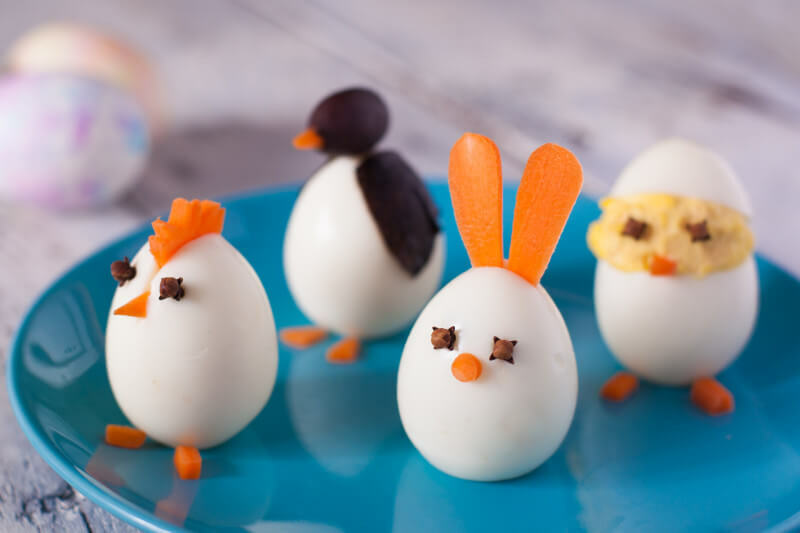 Turn them into these cute and easy boiled egg animals! 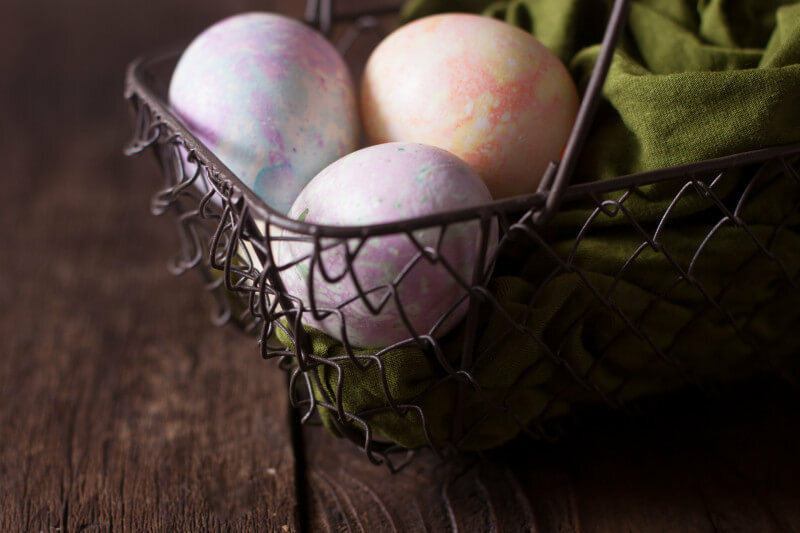 You boiled your eggs, you dyed them gorgeous colors, and now Easter is over and you’re left with the age old question of what to do with Easter eggs after Easter. You could make egg salad sandwiches, sure. Who doesn’t love a good egg salad? 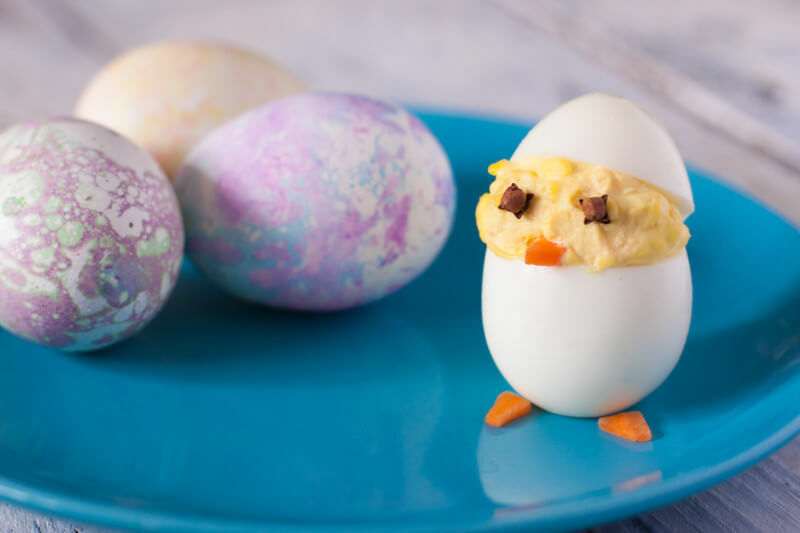 But we prefer turning our boiled eggs into cute little animals. It’s a sure fire way to help the whole family not even notice they’re eating two dozen boiled eggs over the next week! 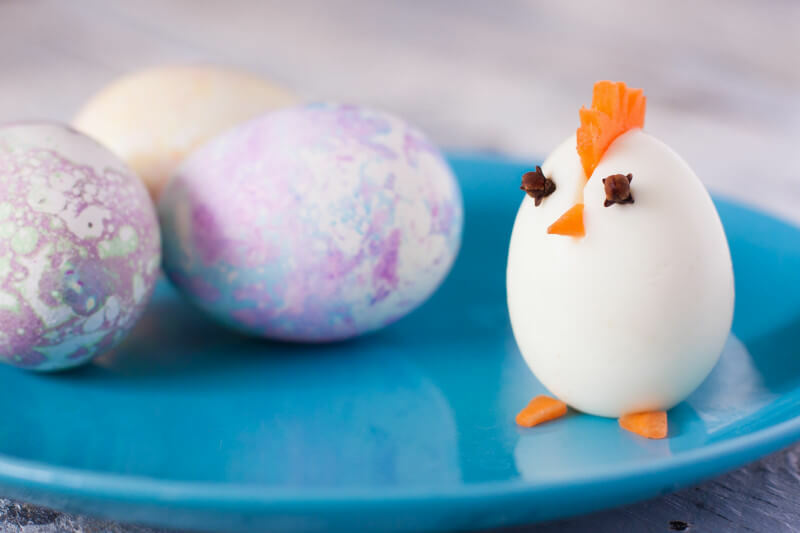 The hatching deviled egg chick is probably the most popular boiled egg animal. I find it’s easiest to do these in batches of six or so eggs so you have plenty of filling to make your little chick heads. If you don’t have a favorite deviled egg filling recipe, we’ve got one for you at the bottom of the post. If making deviled eggs feels like too much work, you can still make an adorable chick out of boiled egg with just a baby carrot and a couple of cloves. As with all the boiled egg animals, cut a razor thin slice off the bottom of the egg to give a flat base for it to sit on. Slice a long thin piece off the carrot. Cut it into a rectangle about an inch long, and cut little triangles out to make the comb. Cut a slit into the top of the egg that goes slightly down the front. Insert the comb into the top of the slit. Then put a little carrot triangle in the bottom of the slit for a beak, and two at the base for feet. 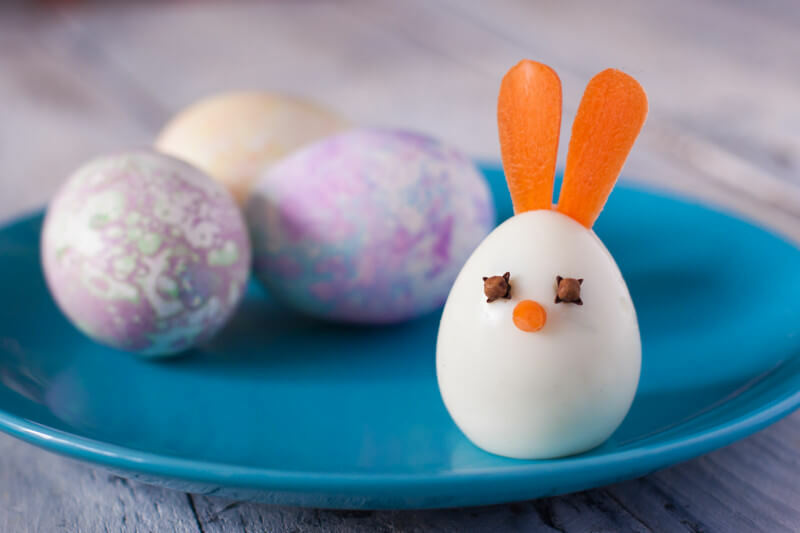 This boiled egg bunny is also made with a baby carrot and a couple of cloves. Cut two long, thin planks off of the baby carrot. Narrow them down at one end. These are your bunny ears. Cut a slit in the top of the egg and insert the ears. Use a straw or a frosting tip to cut a small circle out of another thin strip of carrot. You could even use a hole punch! Poke the cloves in for eyes and stick the little circle nose just below. 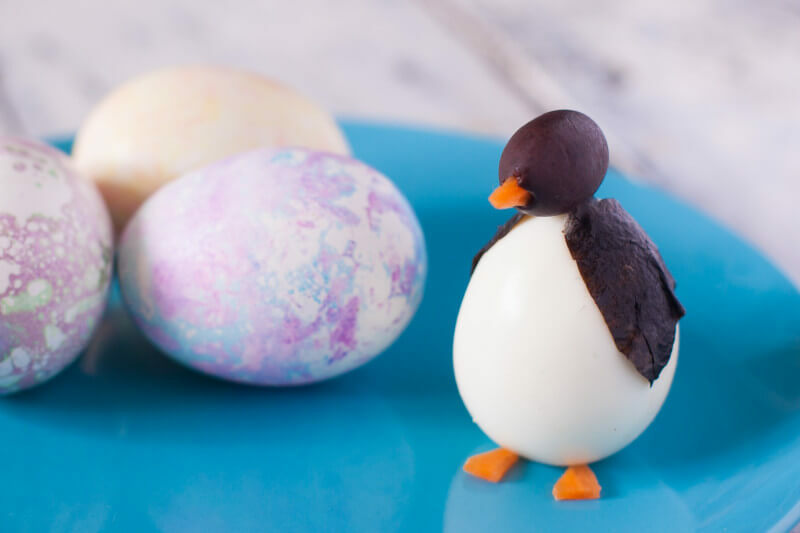 A boiled egg penguin is easy to make with a baby carrot, a kalamata olive, and some seaweed. Cut some little triangles out of the baby carrot. Stick one in the small end of the olive for a beak. Put two more at the base of the egg for feet. Cut a couple of ovals, with one pointy end, out of a piece of seaweed. Gently press them onto the sides of the egg for wings. Stick half a toothpick into the top of the egg and press the olive onto it. Now you never again have to ask what to do with Easter eggs after Easter. 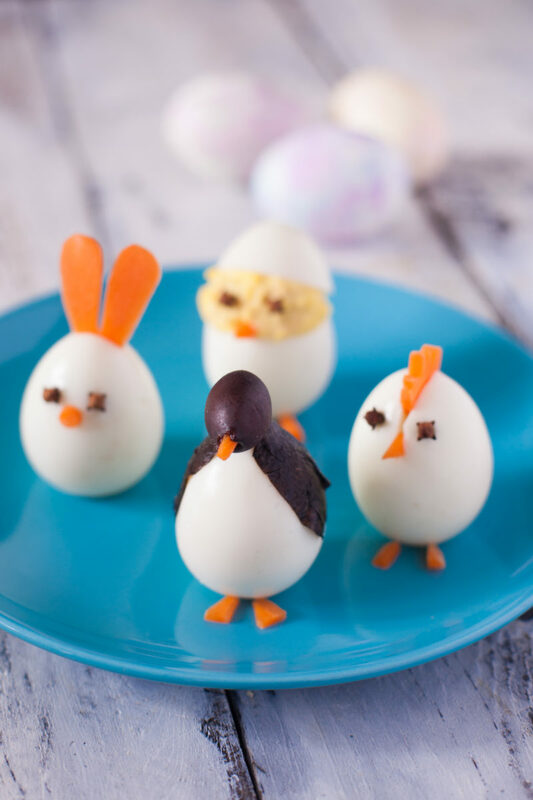 Our family has so much fun with these boiled egg animals, and we hope yours does too! Wondering what to do with Easter eggs now that you're done with Easter? 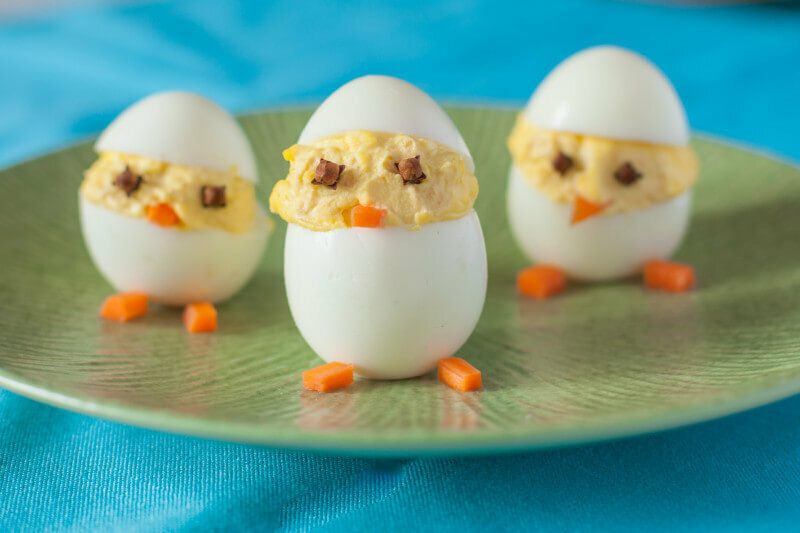 Turn them into these cute deviled egg chicks! We like a tiny bit of heat in our deviled eggs from the addition of Chinese mustard powder. Cut a very small slice off the bottom (flatter) end of each egg. This is the base of the chick. Then cut off the top (pointy) end, about a third of the way down. This pointy end piece is going to be the top of your chick. Scoop all the yolks out of each egg (Don't forget the tops! ), and mix them with the mayonnaise, yellow mustard, mustard powder, and salt. Put the filling into a plastic bag with a corner end snipped off, and pipe it into your bottom eggs. Make sure the filling is at least half an inch taller than the top of the bottom egg white so you will have plenty of room to make a face. Place a top slice of egg white on each chick. Use a knife to slice your into thin pieces, then cut them into little triangles. Place 2 cloves and a piece of carrot into the yolk of each egg to make the face. You may find it easier to use tweezers for these tiny pieces. Arrange the eggs on your serving tray or plates, then add feet by slipping the remaining slices of carrot under their bodies. Again, tweezers can help with this step. Serve cold. Best served within 2 hours. I wish I’d seen these at Easter! my kids would have gone crazy for them especially as they love boiled eggs anyhow. Can’t wait to try it out. Well, now you have early ideas for next year!